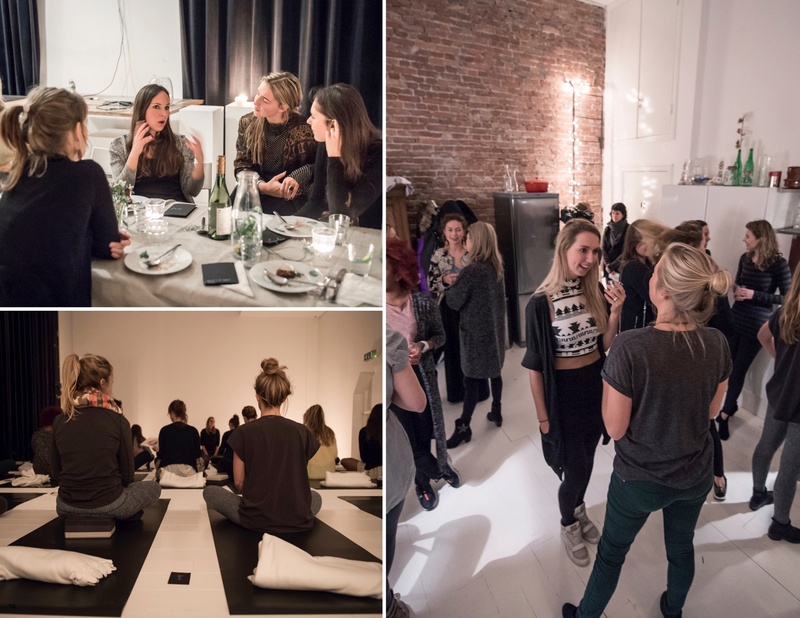 Last Wednesday January the 14th the Dutch lululemon team, Suzan van de Roemer from NL Studio’s and I hosted an event around the theme “Give presence”. 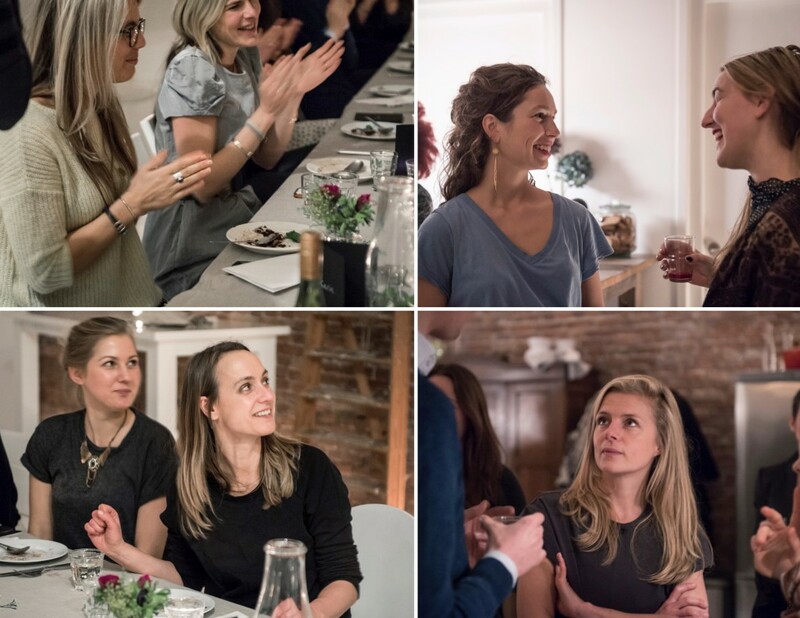 From food bloggers to fit girls, we gathered together a great collection of unique people from different backgrounds. They had one thing in common: a passion for inspiring others to live a happier, healthier and more conscious lifestyle. 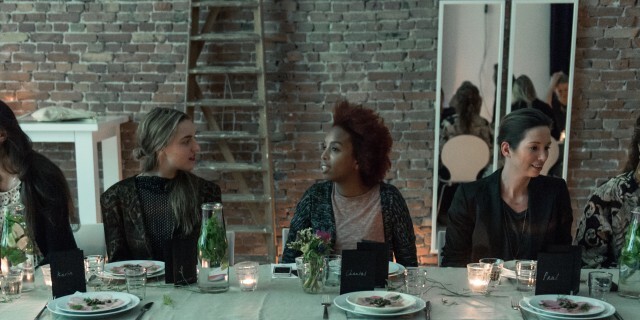 Our event together celebrated the beauty of living in the moment, of giving your presence. Nothing takes you more into the present moment than not knowing what to expect. That’s why we kept the details of our evening program hidden until the evening itself. Our ‘secret’ location was not revealed until the morning of the event. We started our evening in the ‘kitchen’ of the beautiful NL Studio’s. 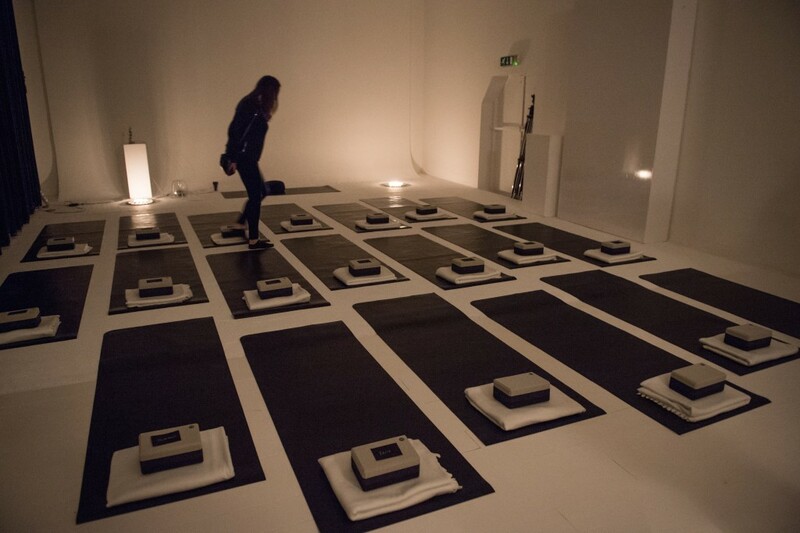 We connected over a glass of healthy mulled wine (without alcohol) and then led our guests through a long narrow hallway lit by candles into a separate space with high ceilings, completely white, lit up by candles and laid out with lululemon yoga mats. I guided everyone into a heart-opening restorative pose. Opening up the chest, the home of the heart, is a great way to create space, to become still and connect with our heart’s desires. Giving presence is about being present in the moment, in the right here and right now but it’s also an important aspect of making our vision and dreams come to life. We all have areas in our lives in which we can be more present. After the heart-openining exercise I asked everyone to choose three areas in life they wanted to give more presence to in 2015. It could be you career, joy, your home, your health, relationships, social life etc. Instead of keeping it inside they had to share their vision with a new friend. Sharing your vision out loud is taking the first step to bringing your vision to life. I enjoyed seeing the enthusiasm, the smiley faces and bubbly energy in the room when people started talking excitedly about what’s important to them. 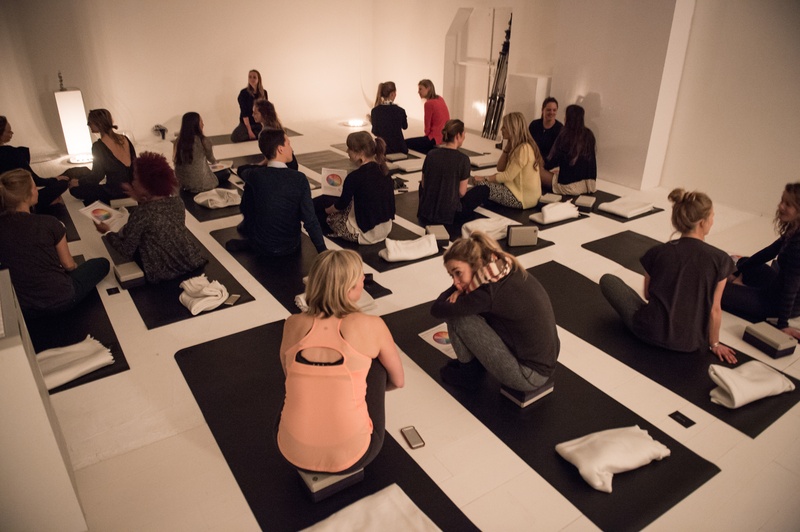 Suzan took over from here and guided everyone through a meditation to connect even more deeply to the vision they created for themselves. 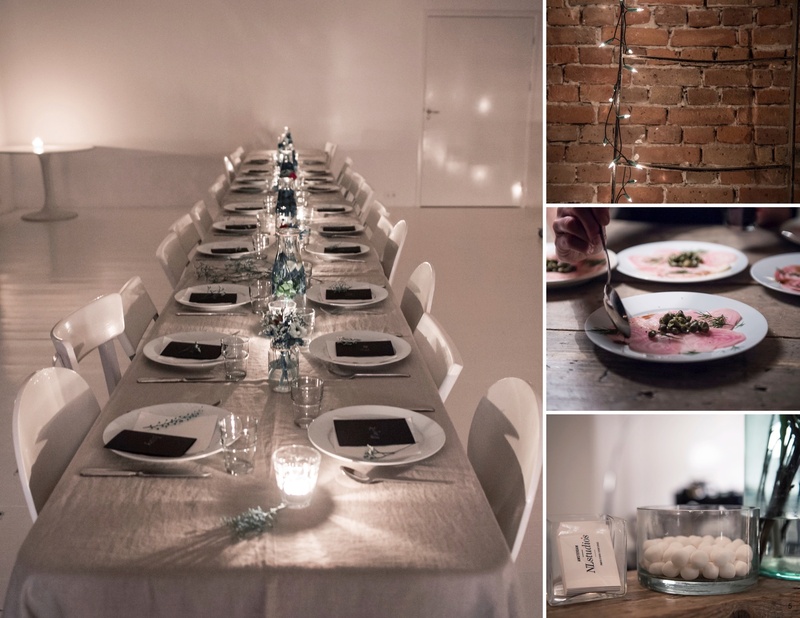 After the meditation we surprised our guests by leading them yet again into another beautiful space, this time with a beautifully decorated table laid out with food. 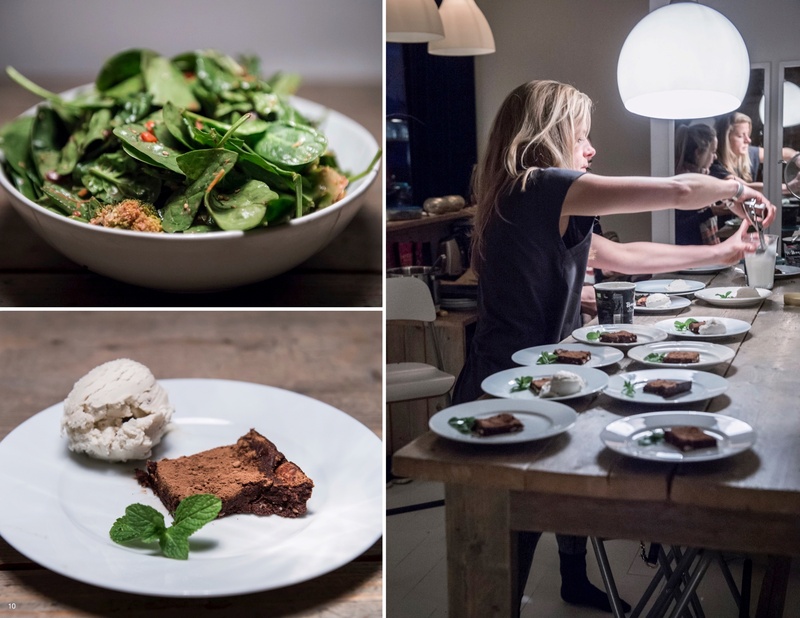 I cooked up a three course healthy and delicious plant-based dinner for our guests. 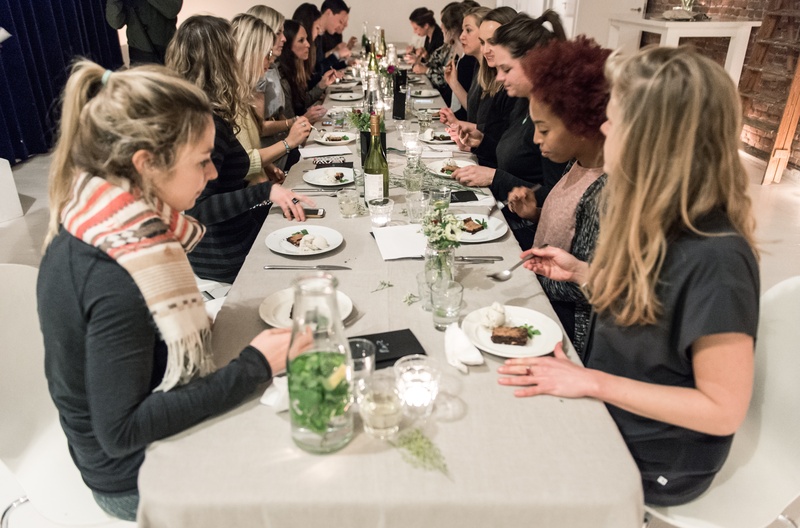 Food is a great way to connect people and to become more present. In daily life we often don’t take the time to savour our food and to be fully present in the company of family and friends. To emphasise the importance of being present we watched the lululemon video on “Giving Presence” before enjoying our meal. 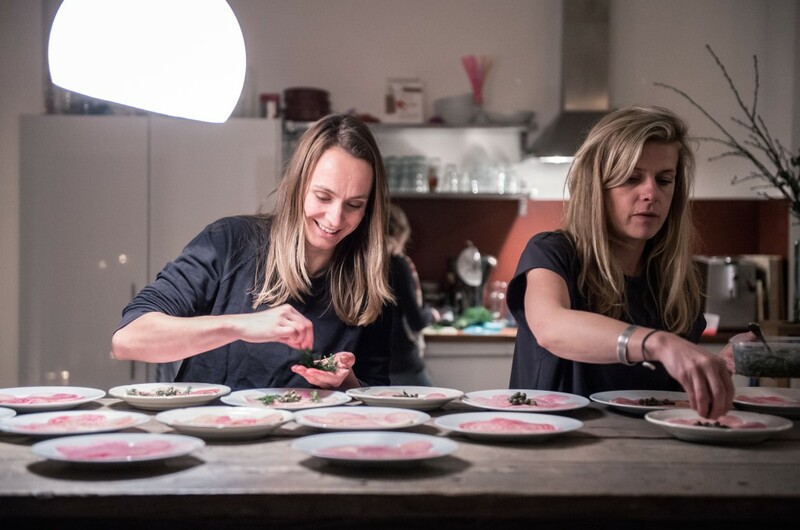 Our ability to enjoy food is closely connected to appreciating the food on our plates and taking our time to savour each bite. However, the message of the video on “Giving presence” goes much further than enjoying a great meal or the company of friends. I strongly believe that giving presence and being grateful for what you have in life are keys to a happy and a successful life. Our biggest obstacle to pursuing our goals in life is wanting to get there too quickly. We tend to get frustrated or even deflated when we don’t get ‘there’ quickly enough or when the ‘there’ does not measure up to our high expectations. If we want to achieve anything in life we need to embrace the present moment and to show up for our life. Resisting the present moment not only holds us back from enjoying life fully but also from achieving our goals. In the pursuit of our goals we need to remind ourselves there’s no ‘there’. You never arrive. You are already here. Enjoy the ‘not being there yet’, enjoy the process and savour each baby step you take in the right direction. Learn to see the beauty in the unexpected, in your imperfections, your flaws, the cracks, your mistakes, your failures. Keep showing up exactly where you are right now. There’s no such thing as perfection. There’s no such thing as failure. Your mistakes and missteps help you to become comfortable with falling and with picking yourself up again. Your mistakes and missteps are important; they help you to move into a new direction, to move forward. Remind yourself you are doing ok. Just keep taking the next step. The key to both happiness and success is giving presence and being grateful for what we have in life. Chasing your dreams is one thing but realizing what’s right there in front of you is everything. If you want to bring your vision to life, do one thing and one thing only: show up for your life, choose to be fully present in everything you do. Don’t focus on ‘being there’, focus on being ‘here’ right now. Let go of unrealistic unexpectations. Let go of any negative thoughts and ideas that keep you from being fully present. Need more joy in your life? Say Yes to seeing joy in every moment. Looking for a deeper connection with the people you love? Give your presence to the people you love. Want to be happier? Offer gratitude for what you have. You become what you practice in life. Focus on what’s important to you and say NO to what no longer serves you. 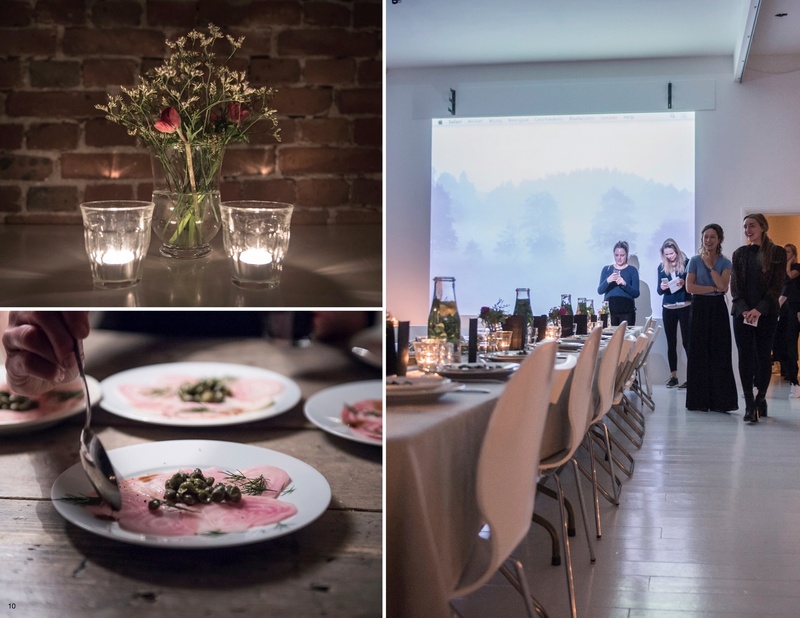 The amazing pictures that captured our event so beautifully are all taken by photographer Mirko Merchiori. Here’s a beautiful video by Talitha and Sanne from Dopplmeister documentaries. that captured the feeling sense of our event.